Do any of you know where you could get a plastic ball like this? I can't think of anything except a paper Chinese lantern or an Ikea hanging round lantern. Any suggestions? 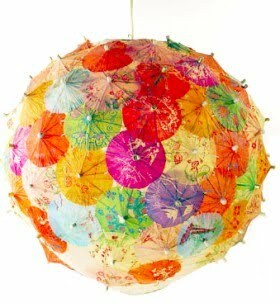 A great way to recycle those cocktail umbrellas after you have a party or get together. Light bulb with cord - you can buy those with a paper Chinese lantern at Walmart or Target. Start by taking the plastic ball and cut a 5cm radius. This will be where you place the light bulb (or light bulb holder) when you are finished. Next you will take the cocktail umbrellas and one by one poke them into the sides of the ball (or paper lantern). If you have problems poking the toothpicks through the ball you can use something sharp like a safety pin to make the holes. Continue to poke them through the ball until the ball is filled. This can then be placed over the bulb and used to decorate any room.